The hype train is about to leave the station, cowpokes. Red Dead Redemption 2 will launch late next month, and Rockstar Games is starting to kick the hype train into high gear. Today, the company revealed more of the world that players will be able to explore when the game releases on October 26. 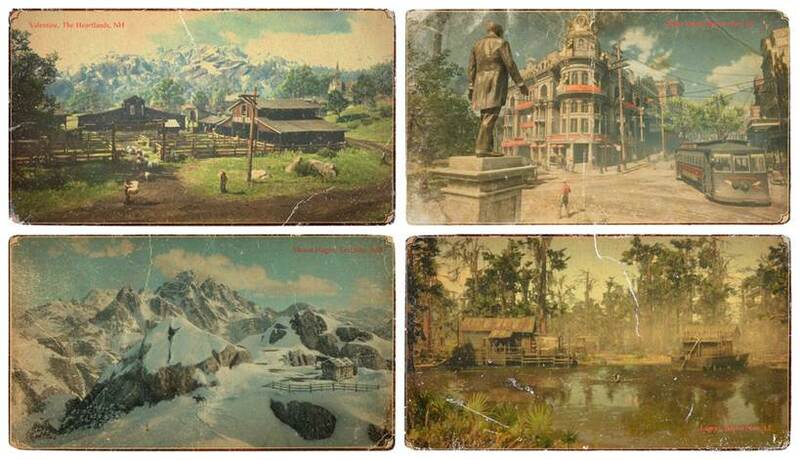 "Discover some of the towns dotted across the vast and varied landscape of Red Dead Redemption 2; from the forests of West Elizabeth to the mountains of Ambarino to the plains of New Hanover to the swamps of Lemoyne." Valentine - The Heartlands, NH - A raucous, rough-and-tumble town in the Heartlands, Valentine’s livestock auctions attract traders, ranchers, cowboys, gamblers, outlaws and prostitutes from far and wide, all looking to make some money, raise some hell, and have a good time. Annesburg - Roanoke Ridge, NH - Life isn’t easy for the miners and their families in Annesburg, which has been providing coal up and down the Lannahechee River for almost a century. Working conditions are terrible for little pay, and many men have lost their lives down the pit. Saint Denis - Bayou NWA, LE - A key gateway into North America with a trade route that runs the length of the country, the bustling city of Saint Denis is a melting pot of cultures and people where businessmen, socialites, sailors, laborers, beggars and thieves all live side by side. Mount Hagen - Grizzlies, AM - One of the more well-known peaks in the snowy Grizzlies of Ambarino, Mount Hagen towers above Lake Isabella to the west and Beartooth Beck to the east, which provides the main pass through the western mountain range and joins up with the Dakota River further south. Rhodes - Scarlett Meadows, LE - Prim and proper on the surface, tensions and corruption run deep in the Southern town of Rhodes, which for years has been caught in the crossfire between the Braithwaites and the Grays, two warring plantation families. Strawberry - Big Valley, WE - Strawberry was little more than a small logging town until the arrival of its new mayor, an East Coast eccentric, who is obsessed with transforming it into a cultural beacon for wealthy tourists, much to the bemusement of the locals. Lagras - Bayou NWA, LE - A small, remote settlement out in the swamps of Bayou Nwa, Lemoyne, the people of Lagras live self-sufficiently for the most part, making a little money here and there from fishing and acting as guides for travelers wishing to navigate the region. Check out the official Red Dead Redemption 2 website for a more detailed preview of all of these locations. The game will release on October 26, 2018 on PS4 and Xbox One.